I am running a version of Sheepshaver acquired from columbia.edu, and I am running it on Windows 7, 64-bit. I think the version from there is mostly a standard installation with some scripts to make file transfer lazier. Anyway, I, once again, have a problem with Apeiron, a game I wish to run. The game launches fine, and it runs perfectly except for one "small" problem. When actually *playing* the game, the mouse will no longer move your ship around. It will still fire, and you can clear some waves that way by just being a little stationary turret, but it's not as much fun as playing it. In addition, the mouse does not work properly when adjusting the controls. I can't actually click anything in the controls interface, it will just verify that I am indeed pressing the mouse one button, but it won't adjust any sliders or tick any boxes. I have to use the keyboard to get out of that screen. Keyboard works fine, by the way. Assistance would be greatly appreciated! This game is crucial to my grandmother's continued (happy) survival. Did you ever try it under Mini vMac II as suggested? That mouse glitch is going to be hard to get past on Windows SheepShaver. Although you may also want to use the versions of the emulators linked from this site, as they tend to be the most tested/documented. Do you know of a guide to getting Mini vMac II to work? I downloaded it, but I'm kind of lost on getting it to actually work. Sorry about that. Edit: Did some serious detective work and discovered a guide right here on Emaculation. Last edited by Tooncinator on Fri May 18, 2018 12:16 am, edited 1 time in total. I think I can put something together later. I´ll have a look at my MEGA cloud too, if you may use something there. MiniVMac just needs the app, ROM and boot disk. Fusion PC either in DOSBox or on real hardware (Pentium III, Windows 98) may be worth a try too. Ooh, Fusion PC. I'll look into that, too. Man, how many Mac emulators are there? Thanks! Seems this is an oddball really. I tried game sprockets 1.7.5 and MacOS 8.6 and there is a controls button on the main screen. However, I can´t seem to configure anything. If the keyboard settings could somehow made working, that might be a solution. Why the mouse is misbehaving just with this game is a mystery to me. It certainly is odd... works everywhere else except in-game and in the controls. I hope it can be fixed! Otherwise, I might have to acquire an old Mac somewhere. From a short look, the mouse issue persists with MinIVMac II, unfortunately. BII Build 142 and Fusion are still to try. but wants to talk to the ADB mouse directly. Edit: The obvious combo DOSBox/Fusion30 fails sadly. Not sure if anybody is willing or able to configure DOSBox with 12MB RAM or so. 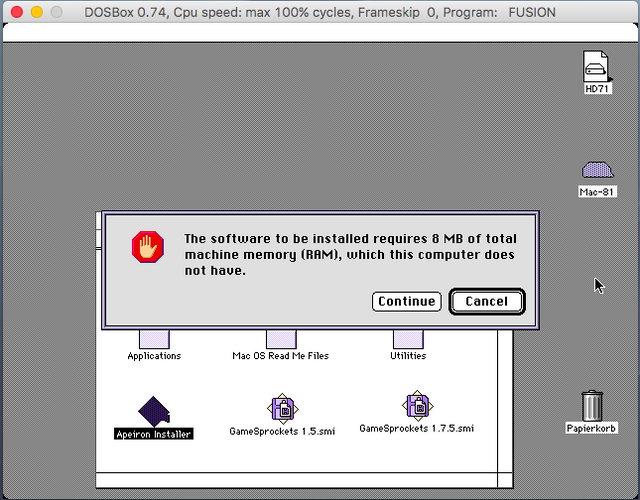 DOSBox default RAM is 4MB. Basilisk II Build 142 shows the same unmovable mouse problem. FusionPC 3.0 handles the mouse for Apeiron correctly! I only have a Virtual Box installation to try right now where sound is not working. e.g. a Pentium III or Pentium 4 rig with Windows ME or lower running in DOS mode. Here is a screenshot, please note the black square. 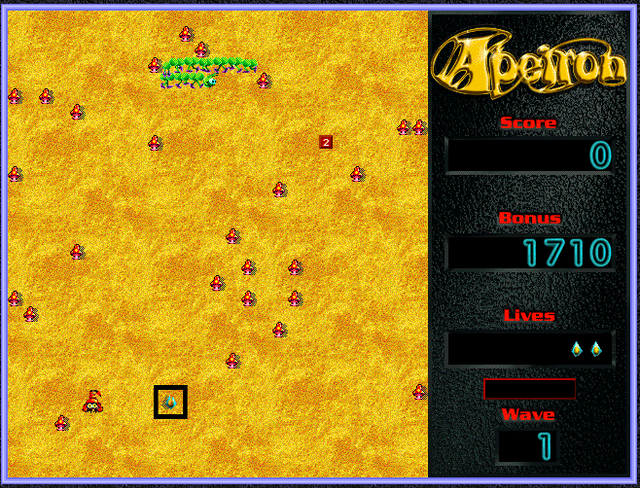 I got Apeiron 1.02 working with mouse in Mac OS 9.2 using the qemu screamer build and the 256 colour vga driver. The usb mouse and keyboard should not be used. I thought that someone should try Qemu. Much better than tinkering with DOS. Last edited by 24bit on Sat May 19, 2018 11:04 am, edited 1 time in total.